Well, this is the sort of devastating story that completely breaks your heart. Usain Bolt went to the Rio Olympics with dreams of finishing off his historic career with more Olympic gold. 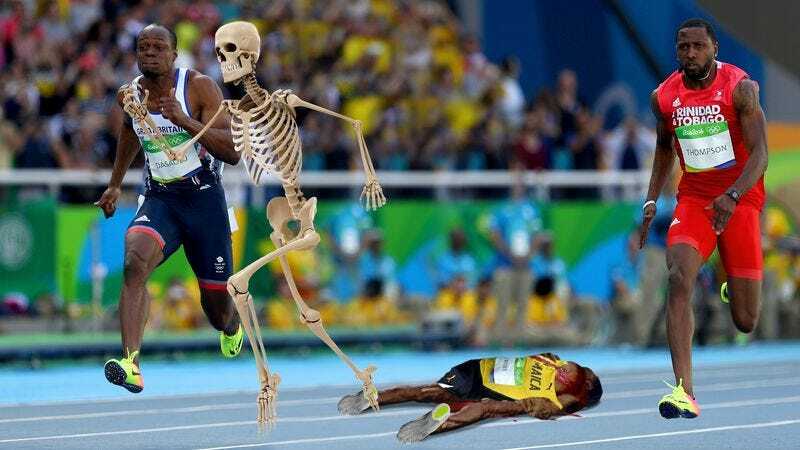 Sadly, those dreams were destroyed earlier today when, right in the middle of the 200-meter dash, Bolt’s skeleton burst out of his skin; continued sprinting across Brazil at incredible velocity while issuing a series of loud, blood-curdling shrieks; and disappeared screaming into the Amazon rainforest. This is the sort of tragic setback you hate to see, especially for an athlete as legendary as Usain Bolt. The six-time gold medalist was leading the pack of the world’s greatest sprinters and almost certainly would have won if his skeleton had not burst out of his body and sprinted away screaming while his empty skin fell to the ground. Bolt’s competitors were forced to run over his amorphous pile of skin, although Su Bingtian of China tripped over it and was knocked out of the race. Bolt’s skeleton sprinted out of the stadium, emitting its continuous, high-pitched screams as it ran across the parking lot, onto the highway, and disappeared over the horizon. It was last reported sprinting into the Amazon rainforest, where it has left a trail of broken branches and dead animals as it has barreled indiscriminately though the thick vegetation, heedless of anything in its path. The International Olympic Committee took to Twitter to address the tragic incident. What makes this even more depressing is that Bolt has announced that this will be his final Olympic Games, and chances are when he imagined the last race of his career, he was picturing himself smiling triumphantly as he stood on the gold-medal podium, not his empty skin lying crumpled on the track as his skeleton went sprinting at top speed into the rainforest, shrieking as it disappeared into the dense foliage of the Amazon. Here’s hoping the rest of the Rio Olympics are filled with happier news. This kind of heartbreaking story is almost too depressing to take. Fingers crossed that the IOC can track down Bolt’s skeleton and put it back in his body ASAP, but, sadly, it’s unlikely that he’ll ever fully recover from a setback like this.